This issue on journalism and media has felt more personal than most, particularly as we prepared for the retirement of editor Bill Holder ’75. While collecting stories of the journalists profiled in these pages, I’ve been considering: What are the traits and skills that outstanding journalists both own and value in their colleagues? This private analysis rises in stark relief against the current political backdrop of name-calling: “enemy of the people” who produce “fake news.” It turns out these taunts can feel like a personal affront to those who value fact-checking and the role of a reporter as a check and balance on power in a free society. This understanding of the function of the “fourth estate” was at the heart of what four panelists spoke about in the Reunion WESeminar Celebration of Wesleyan Writing, organized by University Professor of English Anne Greene. When Bill and I attended “Practicing Journalism in the Time of Fake News” we knew we’d been handed a key feature for this magazine. With Steven Greenhouse ’73, a longtime labor reporter for The New York Times; his daughter Emily ’08, managing editor for The New Yorker; ProPublica investigative reporter Hannah Dreier ’08; and CNN en Español correspondent Maria Santana-Guadalupe ’98, the panelists and audience served up a lively conversation, very Wesleyan in its passionate exchanges. Even the title of the seminar came under discussion: Steven Greenhouse had apparently dubbed it such; daughter Emily felt that the term “fake news” was a distraction. 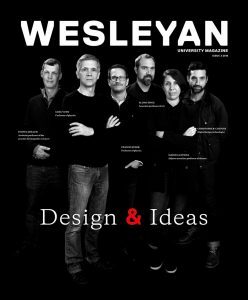 As always, we’re thrilled with the articles we have to share with the Wesleyan community—even as we know that in selecting these, there are so many more that deserve telling. With a population that thrives on asking surprising, provocative questions, Wesleyan has no shortage of intriguing subjects, only limited pages here. Back in South College, I’ve placed three items on my desk in tribute to my mentor: a stethoscope, a camera lens, and a phone case with the Batman insignia. Bill Holder—like the journalists in these pages—taught me to listen with nonjudgmental patience for the heart of the matter; he would focus sharply on a topic, bringing it into startling clarity, and then pull back to show it in context. The phone cover represents conversations with our heroes, the friends and mentors who assist us, much as Commissioner Gordon reached for his secure connection to Batman when trouble threatened Gotham. We hope you’ll enjoy this issue and consider it our version of the Batphone, soliciting your heroic assistance. Let us know about the stories and issues uppermost in your mind, about the journalists and others who engage in important work in our world. We will endeavor, always, to listen deeply and bring our focus to bear on your concerns and interests.